Pretty Pink Damask Candy Bars will surly win your guests over! The perfect candy bar wrapper design for today's modern bride. 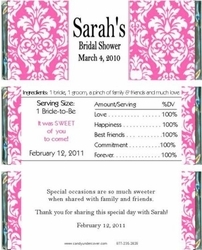 Our PINK & WHITE DAMASK CANDY WRAPPER will add style and sophistication to any Bridal Shower. Wrapped around a yummy chocolate bar for the SWEETEST favor and is sure to be a hit at your party!